Yes, you are the product. But you don’t have to be. Are you the product today? Heck Yeah! In the past two weeks, many people have jumped on the bandwagon launched by Will Oremus’ article “Are You Really the Product? The history of a dangerous idea.” In a nutshell, Oremus argues that the “If you’re not paying for the product, you are the product,” aphorism doesn’t really apply in the case of Facebook. Gini and Joe have different perspectives on this. Gini sees a lot of value in Oremus’ arguments. Joe thinks that his arguments are beguiling, but convoluted, bringing us to the same conclusion: “If you aren’t paying for it with money, you are paying for it in other ways.” Ultimately, he who pays for something sets the terms. Don’t fall into the trap of believing this is an expression of powerlessness. In fact, as Joe sees it, it is a call to action. Instead, think about the more selective, specialized things that we want to do, connections that we want to make, networks we want to create, that reflect our actual interests. Think about why so many people see Slack as their social platform. Why we love using Apple Messages to create groups of friends for sharing. Places that will give us the dignity and respect that we want. That will be geared to us. Not their advertising model. And places that we are prepared to pay for. Don’t fight Facebook. Go outside of and beyond Facebook. LinkedIn. Can it really be 15 years old? It seems like only yesterday we first met. LinkedIn is not as big as Facebook. It doesn’t sit at the middle of the news cycle like Twitter. And it doesn’t have the love directed at Instagram. But it is older than all of these social networks – and it occupies a unique place for business. We talk about how it has changed over the years and our ongoing love/hate relationship with it. Are you really the product? Heck Yeah! by Joseph Thornley, Gini Dietrich, Martin Waxman is licensed under a Creative Commons Attribution-NonCommercial-ShareAlike 4.0 International License. How do you use LinkedIn? Do you publish content on LinkedIn to provide people with a reason to click through to your profile? Do you watch your LinkedIn stats so that you can reach out to these people? Has this provided any benefit to you? Martin Waxman is back and we are grateful because he is much better at the intro and closing than Joe Thornley and me. We kick the show off by talking about the Kelly Blazek crisis situation that happened a couple of weeks ago. As a quick refresher (or the story, for those of you who missed it), the 2013 Cleveland Communicator of the Year received an email from a young professional who is moving to Ohio and searching for a job. Because Blazek runs the 7,300 member marketing job board for the Cleveland area, this young woman sent her a LinkedIn message, explaining who she was, her business expertise, and what kinds of jobs she could do. She then asked to join the jobs board. What she received from Blazek, in return, was both unprofessional and … strange … for a communicator. While we don’t beat this horse to death, it did create an interesting conversation about LinkedIn and how we each use the tool. As it turns out, we have three different uses for it: Ambivalence, referrals, and contact management, which makes it an interesting look at how there really is no right way or wrong way to use social media. Except to not take your bad day out on someone asking or help. 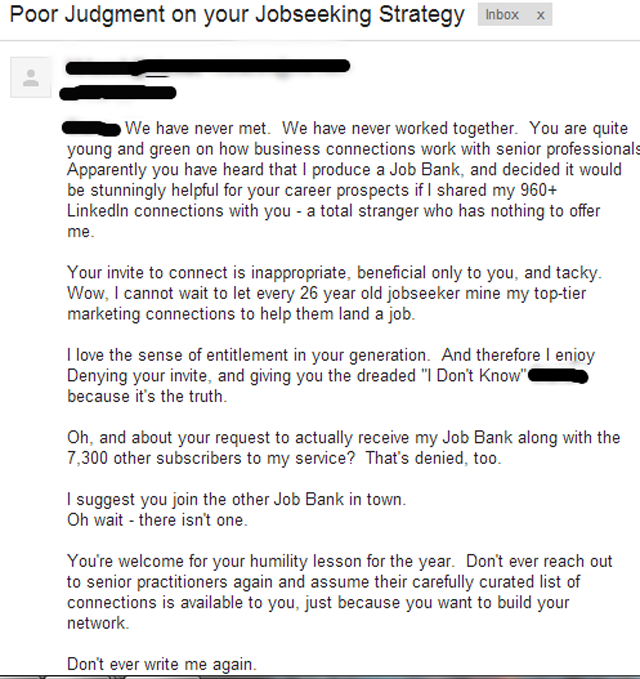 Martin also mentions he hates the generic LinkedIn requests. You know the one. The, “I’d like to add you to my professional network” with no mention on how you know the person or why you’d like to connect. He also talks about his pet peeve, which is people who have never worked with you asking you to write a recommendation. After you listen, we leave the floor to you. What are your personal rules about LinkedIn connections? P.S. While Terry Fallis’s new book, No Relation, doesn’t come out until May, as is his modus operandi, he is podcasting it for you ahead of time. Check it out! This week on Inside PR Terry Fallis and Martin Waxman discuss the topic of Word of Mouth, suggested by Bob Crawshaw of Maine Steet Marketing. 2:24 Housekeeping: Terry introduces the first of two comments. Brent Kinnaird at the Hamilton Port Authority left a comment about Inside PR # 129 not being up. 5:16 Terry introduces the second comment from Bob Crawshaw of Maine Steet Marketing, who suggests that Inside PR discuss Word of Mouth (WOM). 10:06 Terry mentions WOM expert Sean Moffitt who runs Agent Wildfire. 10:33 Martin talks about WOM. 11:03 Terry talks about WOM. 11:56 Terry reads from Agent Wildfire’s website. 12:49 Terry mentions research on trust and gives the example of the Edelman Trust Barometer. 14:05 Martin talks about WOM in terms of Social Networking sites such as LinkedIn and Twitter. 17:41 Martin mentions that anyone who is interested in WOM should read Malcolm Gladwell‘s book, The Tipping Point. 22:50 Terry mentions Sean Moffitt’s involment with WOMMA and his blog Buzz Canuck. 23:45 Terry closes the show.